Lenovo Z2 Plus loaded with cool features like a super-fast processor, built-in sensors, great camera, swift finger-print sensor and many more. Buy Lenovo Z2 Plus available in two color variants and two memory variants at an attractive price, exclusively on Amazon India. The Lenovo Z2 Plus features a 13 MP rear camera and a 8 MP front camera. This smartphone powered by 3500 mAh Li-Polymer Battery and packed with Qualcomm SNapdragon 820 Processor the fastest processor ever. This device comes in two variant with 3GB RAM/32 GB and 4GB RAM/64 GB inbuilt memory. You can store more of all your favourite music, games and apps easily in this device. This smartphone is boast with the Android(Marshmallow) and supported 4G -LTE, you can enjoy fast download speeds and HD voice clarity on this smartphone. Z2 Plus comes with the Google Now Launcher preloaded. If the processor is your prime concern when you look for a new smartphone, then Lenovo Z2 Plus is the right choice for you. The Z2 Plus from Lenovo is powered by Qualcomm Snapdragon 820 SoC processor. Together with 3GB DDR4 RAM/ 32 GB ROM and 4GB DDR4 RAM/64GB ROM respectively in the two variants of the phone available, you are assured of the fastest performance for all your tasks. Be it browsing the internet, multi-tasking or indulging in high-intensity games on your phone, enjoy a glitch-free experience like never before with Lenovo Z2 Plus. The Lenovo Z2 Plus comes with six unique built-in sensors including Distance sensor, 3-Axis Gyro sensor, Light sensor, 3-Axis Electronic Compass sensor, Proximity sensor and Acceleration sensor. The Lenovo Z2 Plus is especially re-designed for the users of India with special features like the Google Now as the default launcher. Moreover, for easy and fast navigation, the phone offers an on-screen keyboard. Love to take photos with friends and family? Use Lenovo Z2 Plus and enjoy clicking the best moments of life with help of the 13MP rear camera, equipped with f/2.2 aperture, EIS stabilisation as well as 0.1 sec PDAF/CAF. 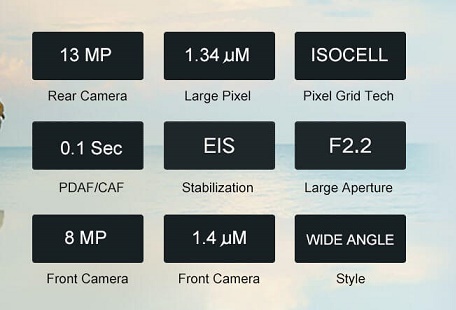 Also comes along is an 8MP front camera with f/2.0 aperture, for all those perfect selfies. Buy online Lenovo Z2 Plus available exclusively on Amazon India.